I never thought I’d be playing a game called Yakuza for the story, but Yakuza 6’s well-written story and characters made this experience a stand-out in JRPG stories this year so far. With an activity-filled open world and satisfying action combat with familiar stat-building systems, these things ended up being the cherry on top of a story that kept me coming back for more with its deep and emotional look into its tough characters that always had multiple sides. I thought this experience would just be a bunch of fights and open world exploring before I played it, so I’m pleasantly surprised that it ended up having a deep story that hooked me in from start to finish and with many of its side activities and stories still left behind, I’m glad its great demo convinced me to try this deep and interesting world. For fans of previous entries of the Yakuza franchise, Yakuza 6 serves as the final chapter in Kiryu Kazuma’s journey. For me, however, it was my first Yakuza game, although I never felt like this was a problem. Kiryu is introduced looking cool and tough as he takes down a Hiroshima thug in the opening scene, but is more than just his tough exterior with softer motives such as how he cares for his family making him feel like a well-rounded character. After leaving prison, when he returns to the orphanage he runs he learns that his adopted daughter Haruka is missing and sets off into the Tokyo red-light district of Kamurocho to go and find her, where he finds she’s in hospital along with her baby Haruto after they were in a hit-and-run incident. Wanting to find out the events that led up to the incident and the father of Haruto, Kiryu sets off to Hiroshima’s town of Onomichi, with plenty of trouble from his past and new friends and foes following him along with way. With plenty of seemingly twisted villains at every turn, Yakuza 6 is impressive in the way it manages to keep them very human. As a game that focuses on the importance of family, there are plenty of moments that put Yakuza 6’s darkest villains into varying shades of grey. There are men fighting for the woman they love or approval from their family, with each antagonist having another layer to them that makes these epic battles of power along the way mean more. It’s this portrayal of its villains and also the surprise betrayals from the seemingly good guys that made me want to keep going through its captivating chapters to try get to the end of Kiryu’s own fight for his family's peace, and with this and a mix of light-hearted moments and tension-filled pre-battle scenes, Yakuza 6 blends just the right amount of action and heart into its 20-hour story campaign that never felt like it got boring. Yakuza 6’s story is also heightened by its flashy action battles that make brawling as Kiryu feel cool. It combines simple fighting game-style combos to attack enemies in a beat-em-up style, but also has the Heat mechanic where Kiryu can use stylish supercharged moves to have pack a bigger punch in battle while looking flashy. These Heat moves are not only strong, but add a bunch of style to the combat, with Kiryu doing things like throwing enemies on top of each other or launching enemies using trash cans and bikes giving it much more visual splendour than other beat-em-up style battles I’ve seen, which is good as its not usually a style of combat I play. Battles aren’t just limited to story scenes though. 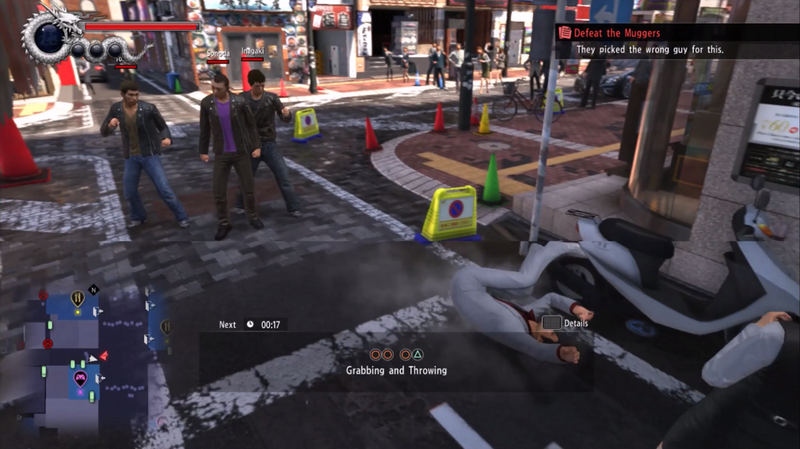 Yakuza 6 has its own version of random encounters that mean you can expect to run into foes on the street as you travel through both Kamurocho and Onomichi and its flashy battles serve as a nice way to keep the tone while running through its big cities. 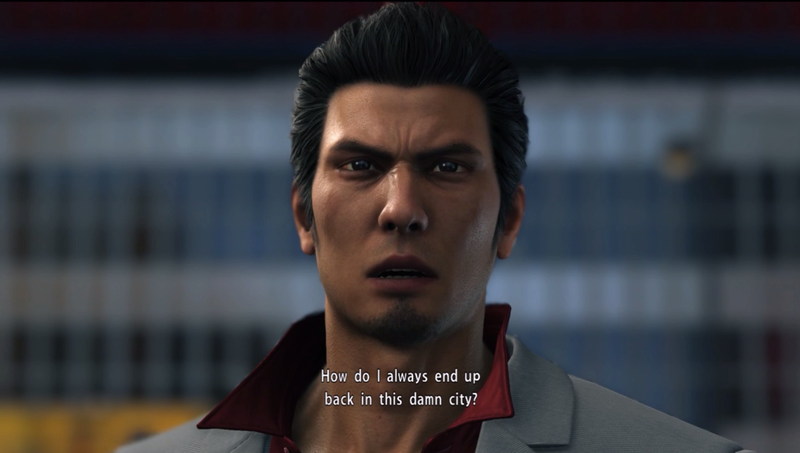 It makes sense as Kiryu is someone renowned in the Yakuza to be running into foes on the street wherever he goes and the way environments had items that can be used in battles as weapons from things as small as pot plants and as big as bicycles made these random battles really shake up the trips to areas in the main story. 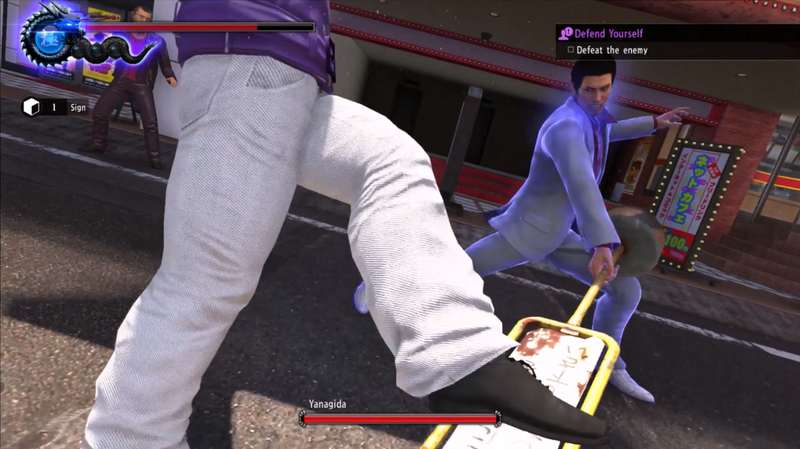 While putting in the same button combos could sometimes feel a little repetitive, watching the outlandish and flashy moves Kiryu was pulling off always managed to keep me excited and although the actual system is quite simple, these flashy moves were always something I had fun watching just for how ridiculous they are and kept battles entertaining for me. It’s worth noting that I loved the combat visuals in spite of the fact I had to get used to some screen tearing since I was playing on a launch PS4 and not a PS4 Pro, so sometimes the amount of things happening on screen seemed to make sometimes subtle and sometimes not so subtle screen tearing in certain fights. This did also happen in other moments in Yakuza 6, but battles are where I noticed the most visual problems and while they weren’t totally distracting, it’s something I had to get used to in my first few hours. But half the time, there would be an opportunity to use a Heat attack that usually didn’t seem to have this issue and thanks to the amount of those, I could enjoy the flashiness of battles as I wanted to without worrying about this visual issue. Adding to the fun of battles is how you level up Kiryu in a much more traditional JRPG sense. Every activity you do nets experience points that can unlock skills and attacks for Kiryu, along with stat increases to help out in battle. As a familiar system, I was most impressed by what kind of things could be gained as Heat skills to make even more use of the field and the places in battle, along with the skills that can be unlocked to help with side activities such as Social Skills to use in bars giving opportunities to customize skills to how you want to play. The other thing I really liked about them was how experience can be gained while eating. 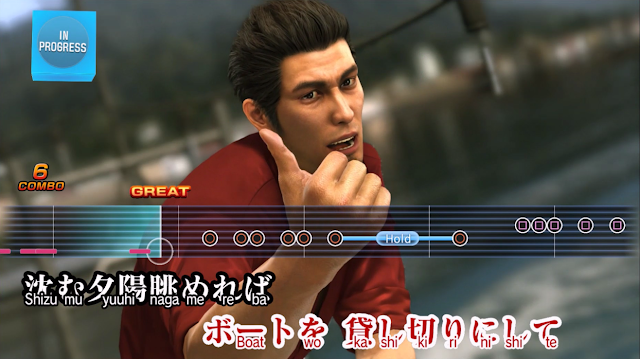 Since Kiryu seems to prefer fighting on a full stomach, feeding him at the many restaurants in Kamurocho and Onomichi offer extra experience points to help you buff Kiryu’s stats and abilities faster and you can even learn skills that help improve his digestion and fullness level to get as much of a EXP boost as possible. Thanks to these, I was able to almost have Kiryu’s base stats maxed out by the end of my first playthrough and this quirky mechanic encouraged me to see more of its environments when searching for restaurants to eat at and helped me learn skills faster that made battles in the end chapters look really cool with all the skills I'd been able to learn. 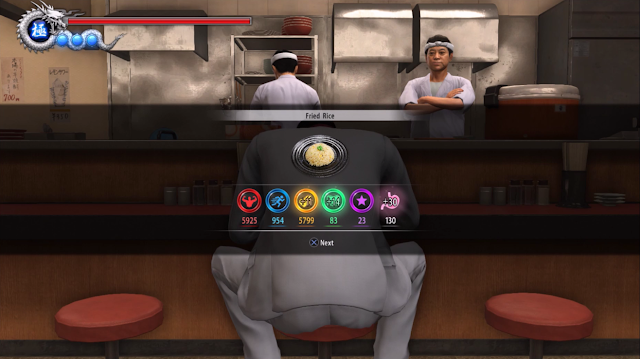 Speaking of restaurants, eating around Japan isn’t the only worthwhile side activity to do in Yakuza 6. There is a wealth of things to do in Yakuza 6 that really make it a game I’m sure can be played for a very long time. You can play retro-style video games at the SEGA arcade, do karaoke, go to hostess bars, take part in tactical battles with the Kiryu clan and most of those are just in Kamurocho, as there are other things to do there and in Onomichi as well. This is in addition to the wonderful side stories that Yakuza 6 has that give you little previews as you randomly run into them in its world and there were a few times where their stories were so touching or interesting I found myself going off track to do them right away or at least wanting to because I wanted to see what happened next. When I look at the amount of engaging things and side stories I want to do outside of its main story, it’s almost overwhelming because there is so much left to do and with side characters with amusing personalities to meet, I’m sure I could turn my 20 hour playthrough into a 100 hour one if I wanted to and the sheer quality of these activities makes me want to consider actually doing it. I’m glad to see the quality of its main story translates into these side ones most of the time and it’s what’s currently compelling me to go back and play more. Yakuza 6 is one of my biggest surprises of this year. Its deep story with its complex villains kept me racing through its main story, and I have plenty side stories and activities left to explore more when I play it again. The rough tone I expected in it translated into a stylish battle system that managed to look very cool in spite of its simple nature and its encounters and things to do in between its story made running around its big cities a real treat. If you’re like I was and not knowing what to expect from the Yakuza series, I would encourage you to give its open world a try and find the parts you like of its full, open world and its deep story in it. Although this is the last part of Kiryu’s journey, this is the first of what I hope to be more journeys into the Yakuza series. You can pick up Yakuza 6 on Amazon! Will you play Yakuza 6? If you already have, what did you think of it?